Since I started baking, one of the two things that I’ve consistently found most challenging has been getting a good, professional like finish on my layer cakes (such as my Rainbow Cake!). I will always passionately argue that the most important thing about any cake is how it tastes, but I think we do also get a great deal of satisfaction from making a cake look great too, especially when it’s for a birthday or other occasion. I am now at the point where I’m (pretty much!) happy with my cake decorating skills so I wanted to share a few of the key pointers you’ll need to follow for the most prettily frosted cakes! This tutorial will give you great results for any cakes, especially layer cakes like my Rainbow Cake and Pastel Rainbow Cake, but also smaller two layer cakes too – any cake with frosting! This may sound a little strange, BUT it’s probably the most important thing you can do if you want perfectly frosted cakes! The most common issue with a freshly baked cake is the cake crumbling and melding with the frosting as you’re trying to work with it. The best cake to frost is one that’s been freshly baked, and then frozen straight away. 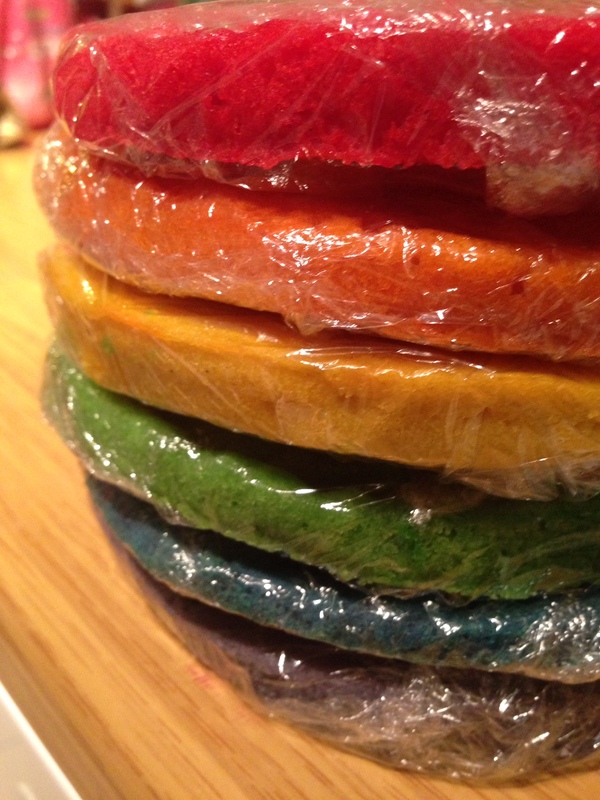 Wait until your layers are cool, then wrap each one individually in cling film and pop them into the freezer overnight. The next day, remove from the cling and frost – the cake will come up to room temperature within a few hours and your frosting will be perfect! For the best results, start with cakes of the same size with flat tops. 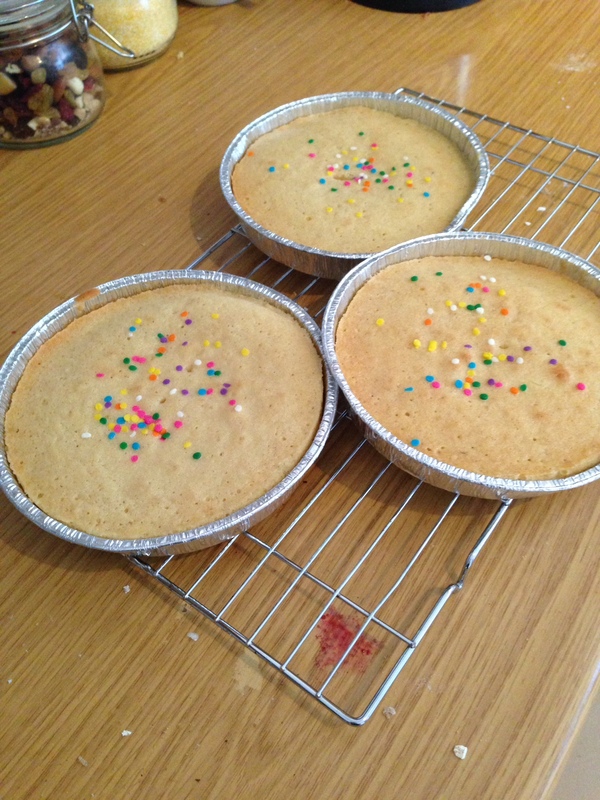 To ensure your cakes are flat, bake them in the middle of the oven, and before they go in, level the tops with an offset spatula, push slightly more of the batter to the outside of the case to offset the rising middle of the cakes. If the cakes you’re working with aren’t level, or if you need to learn how to cut one whole cake into seperate layers, take a look at the video below. Trim the tops of your cakes to achieve a level finish before you try to frost them, but wait until the cake isn’t super fresh out of the oven to do this – just a few hours is enough time. Thicker frostings are much better at hiding the imperfections on a cake, but think of frosting your cake like applying nail polish, or paint to a wall. If you try to slap it all on in one go, the finish will be poor. Instead, several thin layers are built up, with the cake being completely chilled for an hour between coats. Begin with a crumb coat. Take a portion of frosting and put it into a seperate bowl to the rest, and use this to put the first coat onto your cake, ensuring all of the cake is covered, but thinly. This layer will capture any crumbs that come off the cake, and since you’ll be dipping your spatula back into the frosting, keeping it seperate from the rest of your frosting will make sure that your final cake is pure white and perfect. 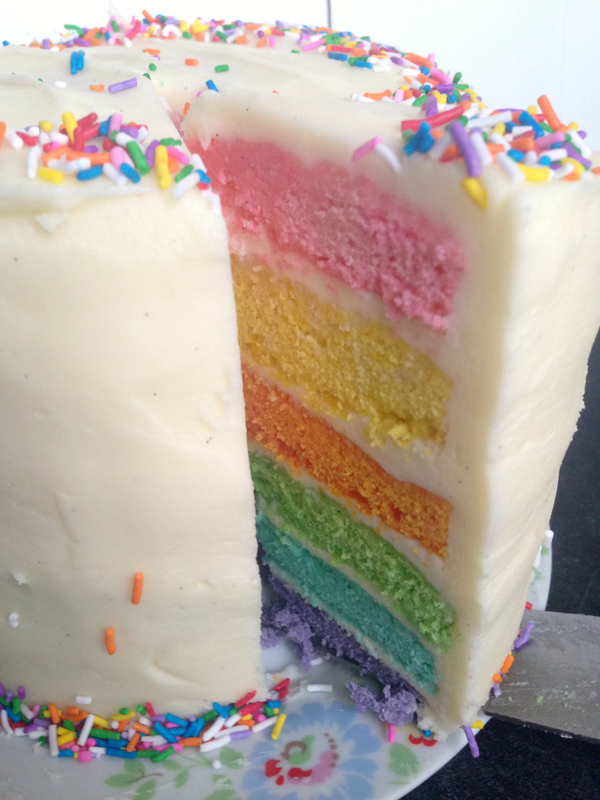 My favourite frosting to work with is my foolproof cream cheese frosting, which is incredibly thick and covers up the brightest of rainbow cakes beneath! If you’re more pressed for time or want a great result without the effort, try a chocolate frosting like this one or any other chocolate frosting. You don’t need all of these for a perfectly frosted cake, but a long, straight tool to smooth the frosting level on the side of your cake is very helpful. You CAN use a ruler, or one of the below speciality tools. Cake scraper – these are useful to ensure that your frosting is evenly distributed – take a look at this video for how to use it! Cake turntable – I don’t currently use a turntable but they can be very handy for professional looking cakes, and you can pick them up for around £5. When you’re finishing off your layers (after building them up thinly, chilling in between), fill a tall heatproof glass or mug with boiling or very hot water, then dip your offset spatula into the water and wipe the blade dry with a teatowel before using the spatula to smooth the surface of the cake. You won’t necessarily ever achieve a 100% perfect finish, but the heat helps a great deal! As you work, wipe off excess frosting back into the bowl, and re-dip the spatula in the hot water, finishing with the top of the cake – I usually do some artful swirls here. And, if all else fails, cover it up with pretty sprinkles and edible flowers! Some great suggestions here – I never thought about chilling the cake between layers of frosting – a great idea! Now… off to check out this fail safe cream cheese frosting! Fab tutorial as ever! Your cakes are stunning and no wonder when so much effort goes in to them. I’ve still not quite cracked the crumb layer. Takes ages before the crumbs quit moving! Thanks so much Emma! I think as long as you’re not averse to a crumb or two at the end – it is a cake after all! Thanks Jac! Me too – when I’m making a big cake I tend to take everything off one shelf to fit it in, even if they’re things that technically need to be in there! Great tips Kerry, I’ve never tried freezing my cakes before frosting them – I shall give it a whirl. I sometimes apply a thin layer of sieved jam (like apricot jam on a rich fruit cake) to ‘capture’ those crumbs. 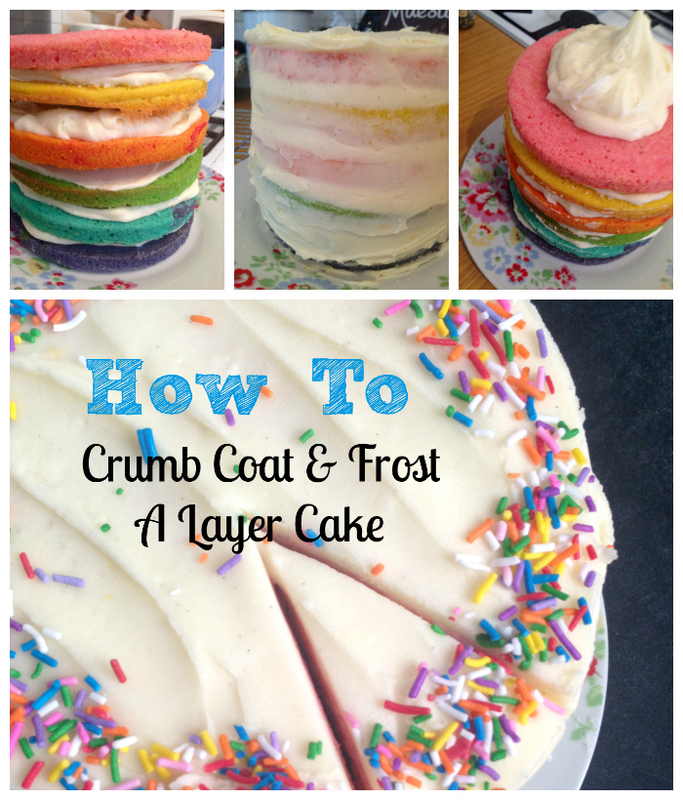 Hey Buddy!, I found this information for you: "How to: Crumb Coat and Frost a Layer Cake". Here is the website link: https://kerrycooks.com/how-to-crumb-coat-and-frost-a-layer-cake/. Thank you.